Egypt: It’s Jan 14. Do You Know Where Your Voters Are? 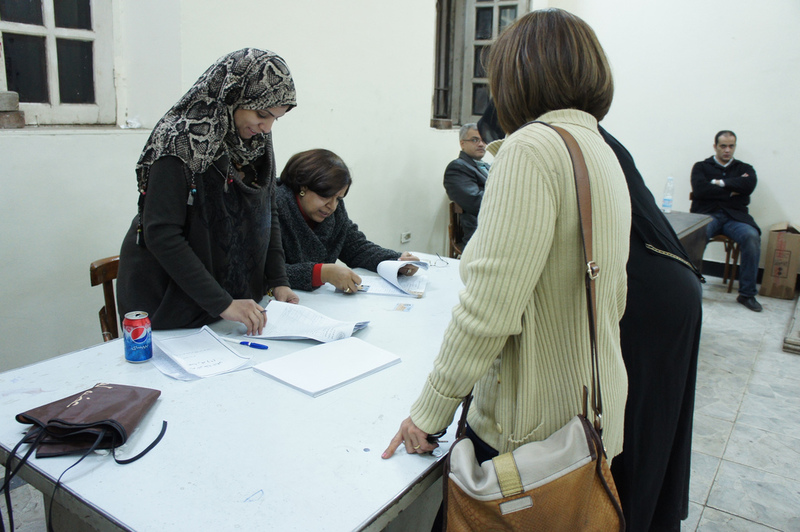 Today and tomorrow, Egyptians go to the polls to vote on a referendum approving the newly-drafted constitution. This will be the third constitutional referendum since protests forced Mubarak to step down in 2011. During the first referendum in March 2011, a boycott of “No” vote was widely urged by the groups whose protests had led to the revolution because they felt the new limitations it posed for the president were insufficient. This campaign was more or less successful, because while the measure passed 77-23, only 44 percent of the population came out to vote. The military leadership did not get the mandate they had claimed the referendum would give them. When General Mamduh Shaheen tried to delegitimize the anti-government protests that continued throughout Cairo by claiming “The people chose SCAF,” his claim was laughed off. A similar thing happened with the constitutional reforms rushed through by the Muslim Brotherhood dominated government in 2012. In spite of reports of sheykhs thundering from the minbar that the new constitution was sanctioned by God, only 33% of voters bothered to turn out, and those that did passed the referendum by a vote of only 64-36. (For that matter, President Morsi tried to push forward as though he had legitimacy on the basis of only a tiny margin of victory–and that only because many voted not for Morsi but against his opponent, who was seen as representing the old regime). I’ve no doubt the referendum will pass today. 350,000 police and soldiers have been deployed to “protect” the elections. Some of these are the same soldiers and police officers who have arrested people for putting up “Vote No” posters or street art. And many Egyptians who go to the polls will go there to vote for stability, at any cost. But General As-Sisi and his colleagues will want more than a pass. They want enough turnout to claim a mandate. If the military government can say, on the basis of voter turn out and electoral results that they represent a clear majority of the Egyptian people, it will legitimize the coup and allow them to move ahead in a strong political position, and to reassure their allies in North America and Europe that electoral democracy has been restored. Gen. As-Sisi will be able to doff the uniform and run for president with confidence. Meanwhile, Egyptians are still waiting for their “bread, freedom, and social justice.” But I do agree with Dr. Khaled Fahmy. There’s no going back to the authoritarian society Egypt had before 2011.